While traveling last week to visit a prospect, I was taken into the label room below (and immediately though that it was a good image for a post!). Not to long ago, I visited a company with this label room. Do you or do one of your customers have a room like this in their operation? If you or your customers have this type of label room, then you have an opportunity to reduce costs and increase profitability in the operation dramatically. In this post, I like to describe three cost reduction/profit opportunities my customers or I have found by moving to print on demand color labels. 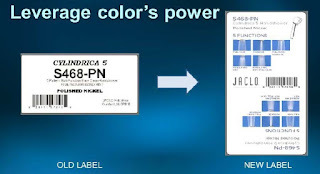 In my travels selling or deploying print on-demand color labels, I have seen many companies with a room or cabinets full of preprinted, prepaid labels that may require an addition step to print variable data. I have heard these companies described as “two-steppers”. Two-Steppers design, send proofs, review proofs, purchase, receive and store preprinted labels in cabinets or rooms. Once they have the preprinted labels, these companies pick, insert in printers, print variable data and put-away the preprinted labels back into the label rooms. The two step process of preprinting and then adding variable data is why these types of companies are called two-steppers. The problem with a two-step process is that it costs money and decreases profitability in three key ways! First, a two-step process increases waste costs. 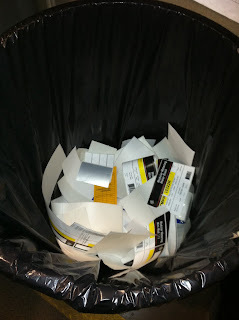 Do you or your customers have trash bins full of labels? This process not only improved the look of their labels (which opened up new distribution and increased sales). 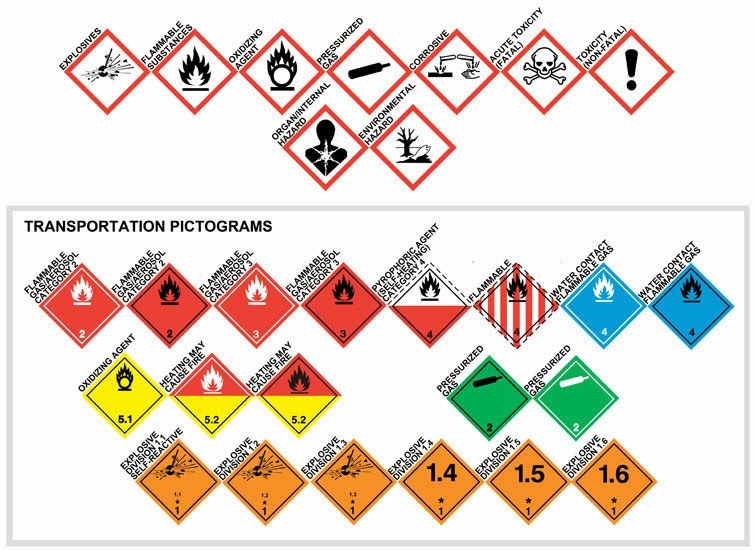 Lastly, a single step, print on-demand color label process will reduce other costs; such as errors/mistakes, plate, freight, administration, receiving, inventory carrying and many other costs that can’t be easily identified. Overall, most people would agree that a 1-step is better than a 2-step process. 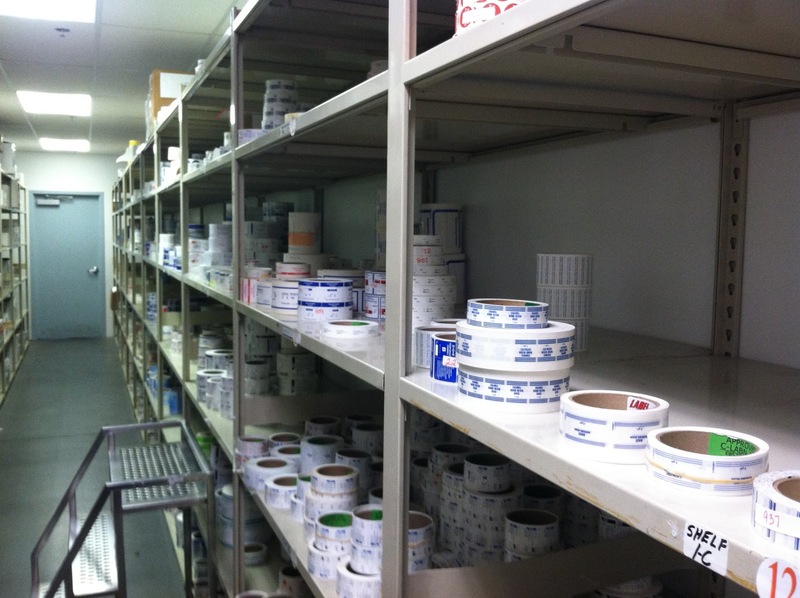 If you have a label room like the ones pictured in this post, consider moving to print on-demand color labels. You and the managers who worry about costs and profitability will be glad you did. Conn-Selmer, (www.conn-selmer.com) under a portfolio of brands, is the leading manufacturer and distributor of musical instruments for student, amateur, and professional use. With a tradition of innovation, and superior musical performance, brands such as Vincent Bach, CG Conn, King, Holton, Selmer, Armstrong, Leblanc, Ludwig, Musser, Scherl & Roth, Glaesel, and William Lewis have earned a legacy of respect unparalleled by any other builders. Conn-Selmer is also the North American distributor of Selmer Paris woodwinds, the US distributor of Yanagisawa saxophones, and the global distributor of the Jiggs pBone (the world's only plastic trombone). With a focus on quality craftsmanship, Conn-Selmer operates US production facilities in Elkhart, IN, Cleveland, OH, Eastlake, OH, Lagrange, IL, and Monroe, NC. To look at a solution for print on-demand color labels, Joe contacted Robert (Bob) Lehman of IMCORP (www.imcorp.com). IMCORP is a Georgia corporation that specializes in providing input, output and connectivity solutions to corporate users of Information Technology. IMCORP offers a wide array of hardware and software products and complementary services at competitive prices. But, they’re most effective when solving problems and creating customer specific solutions. 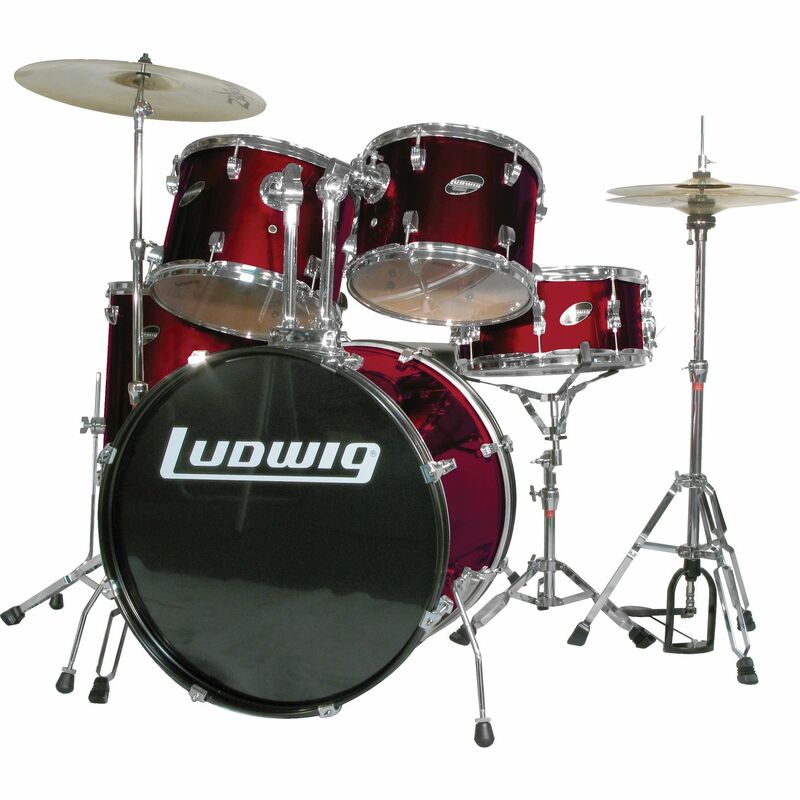 According to Bob “Conn-Selmer required a label to place inside the base drum shell. Once applied, Conn-Selmer needed to over-spray the entire inside surface of the shell, including the label with lacquer. They were concerned about how the ink would withstand this treatment. In addition, Conn-Selmer wanted to make sure the labels made economic sense”. Based on this requirement, I produced a variety of labels for Conn-Selmer to test. After applying the labels and spraying with lacquer, they saw the ink was sufficiently durable for this application. 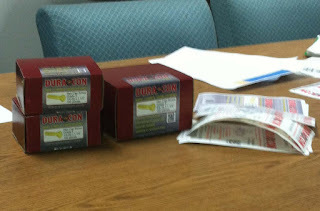 Once label durability was confirmed, I provided a demo printer to Conn-Selmer to develop their overall solution. “With the data from the AS400, Commander controls BarTender to produce the label using the established format and the variable data from the AS400 file system,” said Bob. Continuing, “it’s an easy to integrate utility to enable label printing from an AS400”. If you like this post, you may find this other post covering integration into SAP of value also: http://colorlabelsondemand.blogspot.com/2012/02/color-kanban-cards-keeps-companys.html. Print on-demand color label solutions like the one deployed by Conn-Selmer save manufacturer’s money and time. Probably more importantly, this process would seem to reduce labor, eliminate potential errors and eliminate preprinted label inventory. Consider taking a lesson from Joe’s and Bob’s experience to build this type of great solution on you or your customer’s manufacturing line. 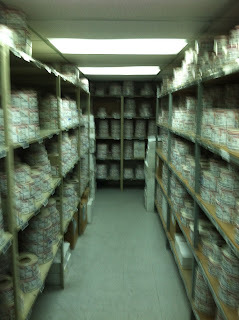 Mudge Fastners (http://www.mudgefasteners.com/) has been family owned and operated since 1975. They understand that every order, no matter what the size, to that customer, is the most important order they process. With both local and global businesses as customers, Mudge Fastener’s growth has been fueled by a commitment to customer service, on-time delivery, competitive pricing and quality products. 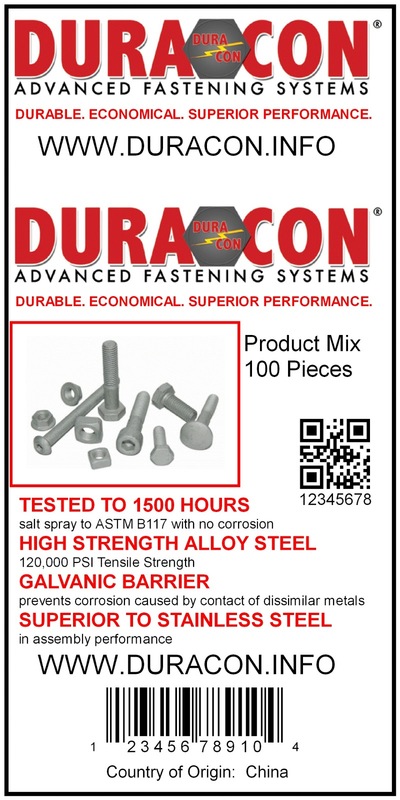 Working with a partner, Mudge Fasteners developed a new line of corrosion-resistant fasteners called Dura-Con (http://www.mudgefasteners.com/p/dura-con-advanced-fastening-systems.html). With the new products, Mudge has been able to open up new distribution such as Menards: http://www.menards.com/main/p-1907907.htm. 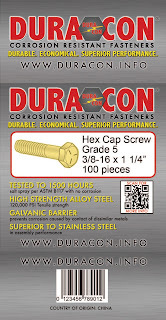 This new product looks like a great opportunity for Mudge Fasteners. 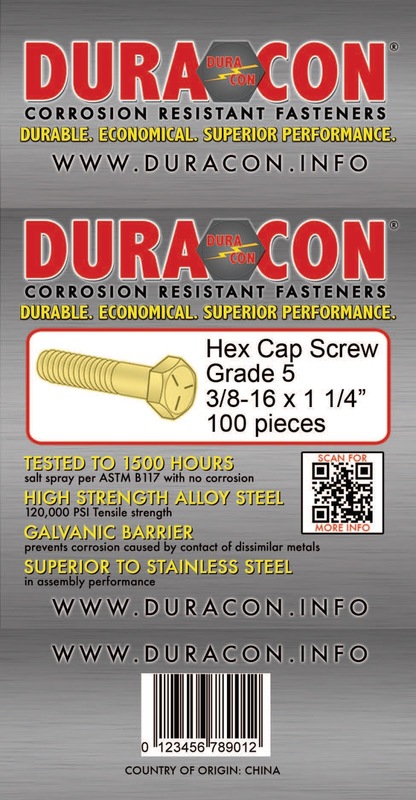 As these new fasteners perform better and cost less than stainless steel, Mudge Fasteners needed to design and produce labels for Dura-Con. 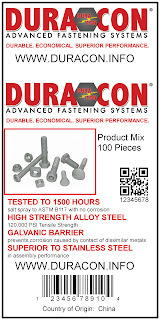 Before visiting Mudge Fasteners, I decided to recreate the Duracon label removing the grey background color. With 100% coverage of ink, labels produced on-demand cost more and are more likely to show the artifacts of the print. I don’t recommend print on-demand labels and the TM-C3400 to produce labels with 100% coverage. At our first meeting, I printed both the initial and recreated product labels. “With our red boxes, I think the white labels look better”, said Paul. After reviewing all of the SKU’s, Paul and Fred decided to reduce the sizes down to 3 different die-cut labels. Managing 3 different blank white label sizes would be much easier than managing a large inventory of preprinted labels. Meeting Mudge Fasteners reinforces my belief in the changes happening in the label business; thousands of companies exist that have a large number of products with labels requiring images, logos and color text. These companies would be better served by moving to print on-demand color labels. If you or your customers have or need labels with images, logo’s, and text for a large number of products, consider moving to print on-demand color labels. You’ll save time, reduce costs and improve your work processes.